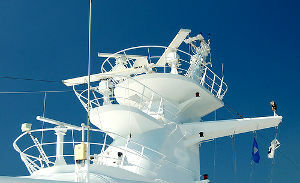 A Radar Endorsement is a license issued by the FCC granting the holder authority to repair, maintain, or internally adjust marine radar equipment. The radar endorsement is not a standalone license, it is only valid when attached to one of the following: GROL, GMDSS Maintainer, GMDSS Operator/Maintainer, T1, or T2. A Radar Endorsement grants the licensee authority to repair, maintain, or internally adjust marine radar equipment. The radar endorsement is contained in FCC test element 8 and is commonly taken at the same time as the GROL, or GMDSS Maintainer Exam. Element 8 contains questions about radar theory and practice applicable to the proper installation, servicing, and maintenance of ship radar equipment. For more information on the GMDSS Operator license, visit the FCC page here.